SAN DIEGO—Kendall French used to pitch drugs to doctors who could prescribe them. But many of those doctors now work for hospitals that don't give them final say over what is on the menu of medicines they can pick. So when the GlaxoSmithKline PLC saleswoman began plugging two new lung-disease drugs to a big San Diego hospital system this spring, it was to an administrator who doesn't see patients but helps write the menu, also called a "formulary," of approved medications. Ms. French urged the administrator in the system, Sharp HealthCare, to consider the two drugs' effectiveness. It was the kind of pitch she once used to persuade doctors to write prescriptions. The administrator, Electa Stern, said she would run the effectiveness data by doctors who are helping decide what to put on a systemwide formulary. "And then we will be taking a look at cost." There are about 2,600 doctors in the Sharp system. Ms. French's sales calls are part of a shift that is rewriting the drug-marketing playbook. As hospital systems get bigger, they are putting distance between their doctors and drug sellers, making it harder for pharmaceutical companies to get quick acceptance of newly approved medicines and putting pressure on profits. As a result, the pharmaceutical industry is shifting its sales efforts from doctors to the institutions they work for. In 2005, drug companies employed about 102,000 U.S. sales representatives, who mostly pitch to doctors. By mid-2014, according to ZS Associates, a consulting firm, their numbers were down to about 63,000. Stepping in are so-called key-account managers like Ms. French who build relationships with administrators. The 20 biggest drug companies employ roughly 600 key-account managers, three times the number five years ago, according to ZS. The trend is in early stages. 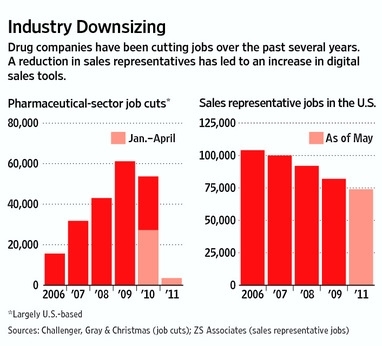 Sales reps still account for the bulk of drug sales. But companies are increasingly deploying key-account managers in regions where hospitals have moved more quickly to buy practices. Eli Lilly & Co., for example, last year scrapped its old sales-rep approach in six metropolitan areas including Boston and Salt Lake City in favor of key-account teams. For the industry, says Lilly commercial executive David Ricks, "one of the key questions is how do we get health-system adoption." Getting a drug on the formulary at a big hospital system can mean potentially millions of dollars in sales from thousands of doctors' prescriptions. For Glaxo, getting its two new lung drugs on formularies is crucial to replacing revenue from its top-selling drug, a blockbuster called Advair that brought in $4.3 billion U.S. sales in 2013. Advair, for asthma and a smoking-related disease, is expected to face generics in 2016 when its U.S. patent expires. Glaxo wants its new drugs, Breo and Anoro, to compete in the huge market for inhalers, which are often used for those diseases. Inhalers brought $13 billion in U.S. sales last year, according to IMS Health, a market-data company. Drug companies used to send armies of sales reps to woo individual doctors after introducing new drugs like these. The reps—some, former cheerleaders with no experience in medicine—would sometimes take doctors to sports events or cater lunches for their offices, and they usually left samples. Doctors were often more interested in a drug's clinical-trial results than cost. Reps could generate hundreds of millions of dollars over the few months after a drug's introduction. But doctors are losing influence. Hospital systems are growing more powerful as they bulk up by buying doctors' practices, nursing homes, urgent-care centers and other hospitals. Insurers and the federal health-care overhaul are squeezing hospital and doctor payments and shifting reimbursement from how much care is given to how effective it is. To manage costs, hospital systems are taking control of what drugs their physicians can prescribe. Many limit doctors' contact with salespeople. The gatekeepers are committees and administrators like Ms. Stern. Today's key-account managers can spend many months trying to persuade administrators to put a drug on the formulary. And big systems have more negotiating power over price than small practices. "Doctors mostly care about how the drug worked," says Pratap Khedkar, who heads the global pharmaceuticals practice at ZS. At health systems, "the sales emphasis has shifted to not just how the medicine works but how it also lowers the total cost of managing disease." Committees at the University of Pittsburgh Medical Center system decide what drugs to recommend based on evidence of effectiveness, toxicity and cost. A committee recently standardized treatment of certain colorectal cancer patients around use of the drug Vectibix, which UPMC says costs about $38,000 for a 16-week course, removing a drug from its list that was found to be similar but cost about 15% more. It says doctors working in its 21 hospitals follow the cancer-drug-prescribing protocols about 80% of the time. UPMC says it bars doctors from catered lunches and sponsored travel, and it requires sales reps to have an invitation from a physician to visit. UPMC official Barbara Barnes says drug companies should see her, not doctors, as their "central point of contact." For drug companies, health systems' expanding control not only can slow new-drug acceptance but may also hurt profits by limiting a drug's peak sales and by driving down prices as systems use their increasing control over what doctors prescribe to press for discounts, says Richard Evans, an analyst at Sector & Sovereign Research LLC who used to head business policy at Roche Holding AG's U.S. pharmaceuticals business. For patients, the trend can be a mixed blessing. They are more likely to get drugs that evidence shows will keep them healthy and out of the hospital, health experts say. But patients may face more restrictions on their choice of drugs. Doctors, too, find the trend mixed. On one hand, "I don't know if you can run a practice by yourself anymore," says Paul Settle, a family physician in Danville, Va. He joined the Centra health system in Virginia in 2011 after 30 years practicing privately, because he lacked wherewithal to negotiate with insurers. Centra says it bars its doctors from meeting drug-sales reps during office hours and is crafting formularies that will direct what they prescribe. "The good side is you spend more time on patient care and not spending your time on drug reps," says Dr. Settle. But it is harder to learn about new drugs, he says, and he has given up some autonomy. Centra declines to discuss Dr. Settle's views. Glaxo has been reworking its sales strategy for about five years. Like others, its reps once approached doctors' offices as their main battleground. "We called it a war," says Deirdre Connelly, a sales rep at Lilly in the 1980s who now runs Glaxo's North American pharmaceuticals business. Drug makers paid big fines for improperly promoting some drugs to doctors. In 2012, Glaxo agreed to plead guilty to misdemeanor charges of illegally marketing some drugs and to pay a $3 billion fine to resolve allegations of improper marketing involving drugs including Advair. Glaxo says it has changed its procedures since then. Around 2009, Ms. Connelly says, Glaxo's research showed doctors were increasingly giving up independence to work for systems that wanted them seeing patients, not reps. "It was hurting sales," says Ms. Connelly, who joined Glaxo that year to fix the problem. "If you cannot get in to the doctor, that affects us." She began testing key-account teams, taking them nationwide in 2011. The teams' key-account managers called on hospital-system administrators while traditional reps called on doctors in the networks where they could. Today, Glaxo deploys 41 of these "integrated customer teams" around the U.S. The teams represented about 30% of Glaxo's $11 billion U.S. sales in 2013. Glaxo expects that to reach 50% within 10 years. In many areas, Glaxo's traditional reps still hold sway. Glaxo's key-account teams are concentrated in areas like Cleveland, Dallas and San Francisco, where health systems have expanded quickly. One such market is San Diego. The Sharp health system, with nearly $3 billion in projected 2014 revenue, runs seven hospitals, three nursing homes, five urgent-care centers, two medical groups and a health plan in the area. The system, which is midstream in its shift toward standardizing patient-care procedures, has in recent years been creating systemwide formularies. Ms. French, 52, joined Glaxo's San Diego account team last year after eight years as a Glaxo sales rep. Her first assignment after retraining was Glaxo's two new drugs, now approved for chronic obstructive pulmonary disease, or COPD, whose leading cause is smoking. Getting on Sharp's formulary would be big. Last year, Sharp's hospitals treated nearly 2,700 COPD patients. Glaxo's Advair is on the systems' formularies for COPD; its two new drugs aren't. The disease is among the latest for which the system is creating a systemwide formulary. In her sales-rep days, Ms. French carried a bag of samples and marketing materials to pass to a doctor. Often, she fetched Starbucks coffee for the staff. She would typically leave after asking the doctor to please write some prescriptions right away—and they often would. Glaxo gave her bonuses if her doctors wrote enough prescriptions. To her Sharp sales call, she toted a leather briefcase and planned no freebies. Sharp says its policy doesn't allow wining, dining and swag-taking. Her bonuses are based not on prescriptions but on factors such as profit and evaluations by system officials. Ms. French's crucial visit was with Ms. Stern, a Sharp pharmacy supervisor who helps lead a committee creating the formulary. Sharp had taken months to consider one of the new drugs—a costly delay for Glaxo—and hadn't given any word on the other. Ms. Stern gave some good news: Sharp was considering both. Ms. French, hiding her excitement at that hint of progress, brought up clinical-trial data on the drugs' effectiveness, which she said Ms. Stern might find helpful when making her recommendation to the formulary committee. It was the kind of information Ms. French as a sales rep would have given a doctor to gin up enthusiasm and trigger prescription-writing. But Ms. Stern wanted to talk about more than trial results. The hospital, she said, was cutting use of pricey inhalers—like the ones Glaxo's two new drugs use—in favor of cheaper and easier-to-use masks called nebulizers. Glaxo's two drugs cost close to $300 a month. Typical nebulizers costs between a fifth and a tenth that, Sharp says. One factor behind Sharp's cost concerns: Starting this year, Medicare will cut reimbursements if COPD treatment doesn't stop enough patients from returning to the hospital. Expensive drugs can land patients back in the hospital more quickly if they can't afford to refill their prescriptions. "You need to look broader than just the episode in the hospital: How are we going to manage the patient not just in the hospital" but after the patient leaves, says Sharp Chief Executive Mike Murphy. Ms. Stern also wanted to know what discounts Glaxo might provide, given Sharp's size. Ms. French offered to return to explain how Glaxo's pricing schedule might benefit the system. Back in meetings that afternoon, Ms. French faced more grilling about Glaxo's prices. "One of the biggest barriers, particularly for the older patients, with using these new medicines, is their cost," said Cecile Davis, a nurse helping remake Sharp's COPD procedures. Ms. French said many insurers were covering the cost of Breo and described a Glaxo program that helps patients with out-of-pocket costs. Ms. Davis said the support didn't cover enough. "If it's not on the $4 Wal-Mart plan, they can't afford it." Four months later, Sharp hasn't decided whether to approve the two Glaxo drugs. "You just have to stay on top of things," Ms. French says, "and when they get to the next layer, be there and make sure they have what they need."